"We are so grateful for her. We value her beyond words!" "Dr. Saleemi is an angel in a lab coat." 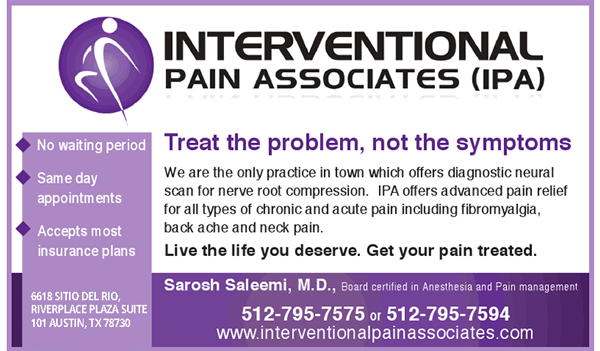 Dr. Sarosh Saleemi is a pain management specialist at Interventional Pain Associates in Austin, Texas. With a philosophy focused on compassionate, holistic care for each patient, she is invested in your well-being. In 2009, Dr. Saleemi decided to make Austin, Texas her permanent home and established Interventional Pain Associates, where she specializes in different types of pain treatments and helping patients heal from acute and chronic conditions. She enjoys getting to know each patient and welcomes a two-way dialogue that helps individuals feel supported, understood, and cared for during treatment. For years, Dr. Saleemi has been offering real solutions to individuals who deal with pain on a daily basis, helping them find lasting results that lead to a pain-free life. After completing her pain management fellowship from Louisiana State University, she accepted a position as an associate professor in pain management at the same university. Dr. Saleemi also completed her Cardiac Anesthesia Fellowship at New York University and her Anesthesia Residency at Beth Israel Medical Center. Dr. Saleemi is board certified in both anesthesiology and pain management from the American Board of Anesthesia. She's also a respected author of several publications and has co-authored studies on low back pain, fibromyalgia, botulinum toxin-A (Botox) injections, and predicting nerve root pathology on a neural scan. She has presented at the American Society of Anesthesiology, the American Society of Pain Management, and the International Association for the Study of Pain. She is a Diplomat of the American Board of Anesthesiology in both Pain Management and Anesthesia. When she is not working, Dr. Saleemi enjoys socializing, reading, traveling, and spending time with her friends. We care about all patients at Interventional Pain Associates. If you have any questions about your insurance, please call the office to confirm for more details. Are You a Candidate for Trigger Point Injections? If you suffer from back pain, you’re not alone. Back pain is such a common problem in the U.S. that some studies have estimated that we spend about the same amount each year for back surgeries as we do for cancer treatments! "She truly cares about her patients and spends time with them which is definitely more than I can say about other places where I never saw the doctor." "Dr Saleemi is a wonderful and caring doctor that seeks to resolve pain instead of a life of constant medication."